alone, decent salaries equal decent workers". currently demanding a pay rise of between $500 and $600 per month. need in order to make a basic living. "There was a diamond auction and we also want that money as workers." and everything possible was being done to address their concerns. salaries, and negotiations have been dragging on for a long time." electoral pact ahead of the 2008 elections. calls for the two factions to reunite ahead of elections expected next year. the late Gibson Sibanda and Welshman Ncube. two groups were to reconcile. the highest number of temporary teachers hence the increasing failure rate. made by the unity government in reviving the education sector. about democracy in that country. evoke memories of the bloody 2008 campaign. politicians to back off from his work. Mutambanengwe has vowed to be his own man. that a free and fair poll can be staged. to work on a completely new voters roll, but has no funds to do that. (MDC) party argued in Johannesburg today. secretary Ngqabutho Dube told reporters. 'normalise' their status as Zimbabwean immigrants. fuel, stable currency and a single digit inflation. Zimbabwe that are contrary to Tsvangirai’s accounts of progress and change. that there will be any real change. his “legacy” as the country’s liberator. between a hero and a villain, of which you have to make an assessment. the current reforms Tsvangirai was speaking about could be sustained. lead to fully democratic elections". interference in the business sector." at least $200 million would be needed to conduct the exercise. believes is necessary to win the next election." could then bring about a stable environment for investors. the Constitutional Parliamentary Committee (COPAC) outreach programme. to halt as all eyes were on the furious chief. to his room," said one of the workers. Mabika shouted at a reporter who had wanted to seek a comment from him. you to seek my opinion, I am a Chief not those boys you are used to phone,"
said Mabika before hanging up the phone. (MDC-T) supporters during 2008 presidential campaigns. go and collect a cow from MDC-T ward one councillor Aurther Kunaka. The villagers are not being represented by any law firm. indication that the National Healing Organ has a long way to go. the 65th session of the United Nations in New York. targeted sanctions were not helping Zimbabwe. regime, claiming the crisis in Zimbabwe was an internal matter,' Zunga said. Mugabe of stalling progress on political reforms. real reforms were evident, targeted sanctions would be lifted. choke him, the Herald said. Change, which became a partner in the inclusive government 20 months ago. farm in which we were allocated land by the government." arrested instead of arresting the cabinet minister," the defendants said. The group was remanded out of custody till September 20, when trial resumes. the bush, and mountains as they fear for their lives. of the CIO who normally come at night to harass us," they said. have threatened to kill us while we are asleep". property since they do not have offers letters. evict the former freedom fighters. before Masvingo magistrate Oliver Mudzongachiso. to evict Robert Buchan, a former white commercial farmer . other things. In addition the farm used to produce flowers for export. The flowers were being produced under the green house effect principle. Bulawayo Magistrate Ntombizodwa Mazhandu on Friday 17 September, 2010 deferred her ruling on an application filed by lawyers representing visual artist Owen Maseko seeking a referral of his matter to the Supreme Court to determine whether or not criminalising creative arts infringes on freedom of expression and freedom of conscience to Saturday 18 September, 2010. The Magistrate who was supposed to hand down her ruling on Friday 17 September, 2010 at 16:00 hrs said she could not do so as she had not finished drafting her ruling. Magistrate Mazhandu will now deliver her ruling on Saturday 18 September, 2010 at 10:00 hrs at the Bulawayo Magistrates Court sitting at Tredgold building. money to conduct by-elections to fill vacant parliamentary and senate seats. million is needed for polls to fill all the vacant posts. are secured, President Mugabe said. Deputy Prime Minister Arthur Mutambara last year. the masses not to vote for parties "living on borrowed oxygen." parties are offside and not representing the wishes of the people. in touch with its support base. its campaign ahead of the other parties. dialogue in the public and private media will affect the outcome. Robert Mugabe's ZANU-PF party representatives turned violent. at the weekend as opposed to the proposed two. biggest threat to the outreach process. media will affect the outcome. constitutional reform, using radio and television. television and radio in the process of gathering people's views. With inflation under control, food back in the shops and a power-sharing government in control, life is getting better for many in Zimbabwe. But none of this seems to have curbed the number of children being abandoned. When I was last in Zimbabwe, 16 months ago, I was told how desperate mothers had been putting unwanted babies on garbage dumps, railway lines, in rivers and even in trees. It has not stopped, according to Grace Mafuku who helps look after children at the Shengu Dzevena Trust Orphanage on the outskirts of the capital, Harare. "Some are found by the river, near the bushes there, and some are left abandoned in the city centre. Some are just left by their parents, they just leave them here," she told me. "Last week a baby was found in a pit toilet and was beaten by stones until she couldn't even cry. The mother thought she was dead and left but fortunately she was found and she's still alive." The orphanage is run by Sister Mercy Mutyambizi, who agrees that improvements in the economy and political system have done nothing so far to ease the plight of many babies and children here. "When we talk about baby dumping, honestly there's no better situation. it's either the same or it's worse," she says. 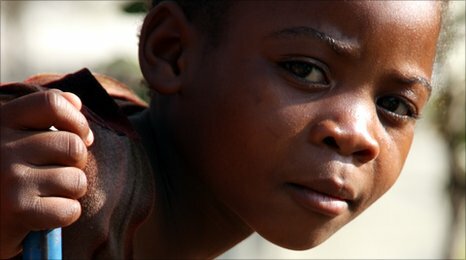 According to the charity, Street Child Africa, a census carried out in 2009 found that there were more than 700 children living on the streets of Harare. Sister Mercy believes that one of the biggest problems is that although food is in the shops many Zimbabweans simply can not afford to buy it. Bread, she says, is now more than $1 a loaf and that is a days wage for some people. But often, she says, it is as much about morality as money. "You get pregnant and the man that made you pregnant will desert you immediately when you tell him you're pregnant," she says. "And now, at home, your family don't want a pregnancy which is out of marriage. And because of that reason they end up dumping their babies." What happens to them after they go to social welfare we don't know. HIV/Aids is a further factor. 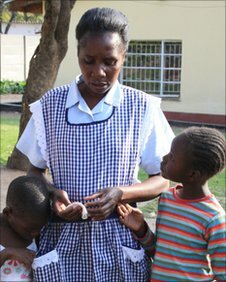 Sister Mercy says many girls left to live on the streets of Harare tell her they have to sell their bodies to survive. "This is increasing the number of people living with Aids in Zimbabwe." 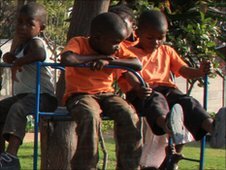 The orphanage currently has 34 children aged between two and 11-years-old. Among them is nine year-old Mary (not her real name) who was just five when she was brought here. She lived in a house "and my grandmother was dead and my grandfather was dead. My father died when I was small. "My mother said, 'wait here, I'm coming.' She didn't come and so I came here." I asked Mary if any of her remaining family members had been to visit her over the four years she has been at the orphanage. After a prolonged silence spent staring down at the floor she replied "no". Looking at these children it is hard to tell that they have had such an awful start to life. Smiles quickly fade when I ask some what they can remember about their life before coming here, but the giggles and chat soon return when such questions stop. After a morning spent doing school work they all play excitedly together, digging holes in the mud or scaling on an old metal climbing frame. But Sister Mercy tells me that resources are now so tight here that food is rationed and new orphans coming to their door have to be turned away. "We are referring the people who bring them to social welfare. What happens to them after they go to social welfare we don't know. "I worry a lot, a lot. My heart will be bleeding. I had a stroke in January and it's all about my concerns for the children." Sister Mercy hopes that the slowly improving economy here will eventually help stem the tide of abandoned children. But, she argues, this won't happen unless the nation's leaders play their part too, and that the only salvation for Zimbabwe's orphans is good government. "If that doesn't change then things will continue to be worse." refusing to state their agenda on why they want to arrest Hon. Bennett. attempt by the police to incarcerate him is only politically motivated. after the signing of the GPA. death of over 500 MDC members in 2008.
behaviour regarding civilised norms of governance. Harare, September 17, 2010: U.S. Embassy diplomats and staff will continue the volunteer mission when they assist with operations at the Tichavaka Brick Project in Hatcliff tomorrow morning. The diplomats, including Ambassador Charles Ray, will perform physical but rewarding labor carrying water; mixing cement, water, and quarry sand; operating a brick molding machine and making bricks by hand. The Tichavaka Brick Project is a community based project composed of approximately ten families residing in the Hatcliff section of Harare. They were established to construct homes and erect kiosks for businesses for its members. Tichavaka is a 2010 recipient of a U.S. Ambassador Special Self-Help Grant. The USG awarded funds to this community group for the purchase of a brick molding machine and brick molders to construct homes and businesses for community members. The volunteer mission by the Embassy started on September 11th which marks the remembrance of those who perished on 9/11. It ends on November 11, which marks Veterans Day in the U.S.
Forum" in the subject line. fields at Chisipite School on 25 September at 6pm. has a message of hope that we all need to hear. The evening is free. let's get there in numbers and hear what Angus has to say. and the future will remain bleak for the vast majority of Zimbabweans. period too so that people continue to live under a dark cloud of fear. consequences of violence for not voting for the ruling party. people will be too scared not to go to the meetings. are also under intense fear. past. They have no power to stop the violence. live? Murambatsvina effectively closed down this option. fearful magistrates. This is no reason not to seek justice though. Ben Freeth - once from rural Chegutu. Saturday midday at the Caves toy shop at Sam Levy's village. Arundel Spar and TM Borrowdale recently. twenties to thirty behind me making a din on which items to buy. up to the time I paid for the games. profiles were caught on camera. blade as the cuts are very "clean". shoulder at 12.30 in the afternoon am sure they are capable of worse. had been given until 3 that afternoon to get out. the devastating anguish of being forced out of their home. sentinels watching over these deserted, seized farms. this house, and they were going to have it today. invaders moved into the garden and then some even into the living room. time. The dust was thick and choking and I felt tears burning my eyes. How can this be? 10 years after it happened to us, it is still going on. or even a family's private home. it is political. Is this Zanu PF politics or Unity Government politics? and do not represent the official viewpoint of Justice for Agriculture. understand: through violence and intimidation? this demonstrates a serious lack of judgement on the MDC leader's part? Chitoro said, "We know the old man (Mugabe) can't share power with anybody. at using other people especially uneducated ones in order to stay in power." still bear the scars of Zanu PF violence from past elections. Mugabe and his party cannot not even abide by the GPA? thing: Mugabe will never surrender power. Yours in the (continuing) struggle PH aka Pauline Henson. Twenty three months have now elapsed since the signing of the Zimbabwean Global Political Agreement (GPA) but there is little real progress to show for the effort, the resources and the livelihoods that have been consumed in the ongoing political stalemate in Zimbabwe. Once again we have looked to find the origins of the chaos by analysis of the facts to hand. Over the month of August, seventy-six news articles from the internet media were captured and catalogued through the month of August. Each article is a unique record of a breach of the terms of the GPA. Categorising these articles according to the nature of breach, allows basic statistics to be drawn from them. The results clearly show the cause of Zimbabwe's governmental malaise. This month saw the Constitutional Outreach program in full swing. Consequentially, a huge rise in the number of attempts to derail the national exercise has made this the top breach in our media monitoring exercise with 19 articles (25% of the total). A worrying trend that emerged here is the fact that, of all breaches recorded against the outreach exercise, 68.42% of them involved violence, intimidation, hate speech or abductions. (It should be noted that ZZZICOMP independent monitors have been cataloguing problematic constitution outreach issues specifically, providing far more detail than the ZIG Watch project can hope to achieve). Cases of deliberate non-cooperation with the terms or the spirit of the GPA ranked second in August, with 15 articles (19.7% of the total), while cases of violence, intimidation, hate speech and abductions came in third with 12 articles (15.8% of total). Summarising just these three most significant categories, Zanu-PF were accountable for 96.7% of breaches of the GPA that were recorded for those three categories alone in the month of August. Overall, Zanu-PF was either responsible for, or involved in, 93.4% of all breaches recorded for the GPA for the month of August. Other significant results were cases of harassment through the courts of MDC supporters and politicians, and cases of corruption, which ranked in as joint fourth with 8 articles each (10.5% of the total, each). Looking out across the Zimbabwean political landscape, one could be forgiven for being somewhat confused. In the clear light of day, Zanu-PF is waging an unrelenting campaign of intimidation and violence around the Constitutional Outreach exercise, against their perceived "opposition" - their GPA partners. This is being clearly documented on a daily basis through the local and international press. However, the SADC - who have underwritten the implementation of the GPA process, with the lead of South African President Jacob Zuma - are silent on such issues. Indeed, they have even failed - without any official comment - to put into force and effect the clear and unequivocal rulings of their own regional legal tribunal with respect to Zimbabwe's illegal land seizures. The international community are also worryingly silent over these issues. The ordinary Zimbabwean continues to trudge on, somehow still hoping that there is a brighter tomorrow to look forward to. As we noted above, attempts to derail the national Constitutional Outreach exercise made it to the top spot this month, with Zanu-PF demonstrating the brazen use of violence and intimidation in Umguza in Matabeleland North. War veterans and a Zanu-PF councillor ordered all MDC supporters to vacate the area before 15 August or their homes would be burnt. This was to make sure that no MDC supporters will be able to attend the meeting of the Constitutional outreach team which is expected to start holding meetings to gather views for a new constitution in that area on that day. However not all Constitutional outreach news has been bad. In an uncharacteristic, but laudable case of resistance during the exercise, villagers in Nyanga North constituency gave a group of axe-wielding Zanu-PF militants a shock when they stood their ground. The seven militants attempted to disrupt an outreach meeting here, not expecting any opposition. The 500-strong crowd at the meeting easily disarmed and apprehended the men, who were handed over to Nyamaropa Police Station. In a typical and high profile case of non-cooperation with terms or the spirit of the GPA, President Robert Mugabe cast serious doubt on any hope of the inclusive government implementing the GPA when said he won't meet any further demands of the MDC until targeted sanctions are repealed. This is a complete U-turn on what Mugabe and his partners agreed to in Windhoek. The SADC Troika on Defence, Security and Politics resolved that agreed issues in the Global Political Agreement should be fully implemented within a month. The MDC remain adamant that they have no power to force the West to remove the targeted sanctions. And, in a deliberate move to snub his GPA partners, President Robert Mugabe ignored a request to declare veteran MDC politician Gibson Sibanda a national hero, despite his imprisonment for three years in a Rhodesian prison for transporting weapons for the country's freedom fighters. Mugabe said the former trade union leader would be "accorded a state assisted funeral" - a far cry from 'national hero' status which comes with a burial at the National Heroes' Acre shrine in Harare. The scourge of violence continued to haunt Zimbabwe, with war vets leader Jabulani Sibanda threatening Prime Minister Tsvangirai, 'Tsvangirai is just like a fly in a a bus. The fly can sit on the driver's seat but that does not make it the one in charge of the bus. He can be eliminated .. ," Sibanda ranted. Despite police claims that they had not heard the threats, video from a mobile phone showed the war vets leader accompanied by the Officer in Charge from Mashoko Police Station. In a bizarre case showing the extent of the breakdown of law and order in the country, two state prosecutors based in Matobo in Matabeleland South fled the country after being severely tortured for their role in sending three war vets to prison for stock theft. The three war vets were convicted and given 15 year jail terms for stock theft. Mysteriously, the three were released from prison after barely three weeks, and teamed up with CIO's in Matobo to take revenge on the prosecutors. The two were picked up and severely beaten by security agents. They were taken to court facing flimsy charges, but were released on bail. They then decided to flee Zimbabwe. Harassment through the courts of MDC politicians and their perceived supporters is still rife in Zimbabwe, as shown by the Attorney General's office new appeal against the acquittal of prominent human rights lawyer Alec Muchadehama - eight months after his discharge. In the Notice of Appeal the Attorney General argued that Magistrate Fadzai Mthombeni erred in acquitting Muchadehama. He wants Muchadehama to face a continuation of the trial. The meaning of corruption sank to a new low in Harare this month as Officers in the Criminal Investigations Department (CID) were being investigated following reports they are demanding bribes from people applying for police clearances. One woman said she had been asked for $10 to have her papers processed the same day. An officer in the Serious Fraud Section said activities of CID at Morris Depot in Harare were being closely monitored following complaints. He also implied that some wanted criminals were being cleared of charges after giving kickbacks to corrupt detectives. Sadly, all partners to the GPA, in a serious case of subversion of a legal process, are allowing two batches of diamonds - of contested ownership - to be sold on Wednesday. By their silence, they are either knowingly or unwittingly in contravention of a high court ruling banning their sale. A deal reached between the Mines Ministry and the Kimberley Process last month will allow Zimbabwe to sell two batches of diamonds. ACR has been fighting a legal battle over ownership of the mine site, with the group's CEO warning that international buyers will be buying stolen goods if they buy the diamonds mined by Mbada and Canadile. In another clear attempt to subvert a legal process - this time with respect to the Southern African Development Community (SADC) tribunal, Zanu-PF hatched an elaborate plan to try and make the world believe that the SADC regional Tribunal had been suspended, with the ruling against President Robert Mugabe's violent land reform programme being held in abeyance. Zimbabwe State media rushed to announce Justice Minister Patrick Chinamasa's claim that the tribunal had been suspended for six months. However, the SADC executive secretary Tomaz Salamao revealed Wednesday that the (SADC) Tribunal was not suspended. "No-one suspended the Tribunal.In the meantime, they can deal with those (cases) they have at hand (including Zanu-PF's illegal land seizures in Zimbabwe)." Please Note: We did not do a mailing for Zimbabwe Inclusive Government Watch Issue 18, but all breaches for that period of time have been logged on our website. A summary of breaches mentioned in this mailing appear below. Further information, with links to original sources for all cases logged, are available online. Please visit www.sokwanele.com/zigwatch for counts and tallies of ongoing breaches of the Global Political Agreement. War veterans and a Zanu-PF councillor in Umguza in Matabeleland North have ordered MDC supporters to vacate the area before 15 August or risk having their homes burnt. This is planned to ensure that they will not be able to attend the COPAC meeting penciled for that day. The Constitutional Parliamentary Committee (COPAC) outreach team is expected to start holding meetings to gather views for a new constitution in that area on that day. Umguza constituency is under Zanu-PF legislator Obert Mpofu who is also the Mines Minister. An MDC member said "No MDC supporter should be allowed at the COPAC meeting as this will disturb their plans, which we don't know." Villagers this week stopped a group of axe-wielding militants from disrupting a constitution-making outreach preparatory meeting in Nyanga North constituency, according to constitutional reforms boss Douglas Mwonzora. He said seven people, armed with axes, stormed Nyadowa Business Centre, the venue of the meeting, with the intention of attacking officials and participants on Sunday. "There was violence in Nyanga where seven people armed with axes tried to stop a meeting I was addressing. The meeting had about 500 people and it was a preparation to public meetings that were starting this week," said Mwonzora. Because of the big crowd at the meeting the men were apprehended and were handed over to Nyamaropa Police Station. The countdown for the inclusive government to implement the GPA, as resolved at the SADC summit, began on the day the Troika tabled the report on Zimbabwe in Windhoek, Namibia. The SADC Troika on Defence, Security and Politics resolved that agreed issues in the Global Political Agreement should be fully implemented within a month. But President Robert Mugabe on Friday cast serious doubt on any hope of this happening when said he won't meet any further demands of the MDC until targeted sanctions are repealed. This is a complete u-turn to what Mugabe and his partners agreed to in Windhoek. The MDC remain adamant that they have no power to force the West to remove the targeted sanctions. President Robert Mugabe ignored a request to declare veteran Gibson Sibanda a national hero, despite the fact that Sibanda was imprisoned for three years in a Rhodesian prison for transporting weapons for the country's freedom fighters. Mugabe took just hours to consider a request for hero status on Tuesday before writing back to Deputy Prime Minister Arthur Mutambara - leader of a faction of the MDC - saying the former trade union leader would be accorded a "state assisted funeral". A state-assisted funeral means he will be buried wherever the family chooses with financial and material help from the state - which is different from 'national hero' status which comes with a burial at the National Heroes' Acre shrine in Harare. War vets leader Jabulani Sibanda has threatened Prime Minister Morgan Tsvangirai, comparing him to a 'fly' that could be easily killed by swatting it against a window. 'Tsvangirai is just like a fly in a kombi or a bus. The fly can sit on the driver's seat but that does not make it the one in charge of the bus. He can be eliminated .. ," Sibanda ranted. Despite police claims that they had not heard of the threats, MDC-T spokesman Nelson Chamisa said a villager used a mobile phone to record a video of Sibanda making the threats. The video showed the war vets leader was accompanied by the Officer in Charge at Mashoko Police Station. Two state prosecutors based in Matobo in Matabeleland South fled the country earlier this month, after they were severely tortured for their role in sending three war vets to prison for stock theft. In July, the three war vets were convicted and given 15 year jail terms for stealing cattle belonging to the Nkomo family. Mysteriously, the three war vets were released after barely three weeks, and they teamed up with CIO's in Matobo to take revenge on Moyo and Chaita. The two public prosecutors were picked up and severely beaten by the state security agents. They were taken to court facing flimsy charges, but were released on bail. They then decided to flee Zimbabwe. The Attorney General (AG)'s Office has appealed against the acquittal of prominent human rights lawyer Alec Muchadehama, eight months after his discharge. In the Notice of Appeal and the Grounds of Appeal the AG argued that Magistrate Fadzai Mthombeni erred and misdirected herself in acquitting Muchadehama and Constance Gambara, the clerk of High Court Judge Justice Chinembiri Bhunu, whom he was jointly charged with at the close of the State case last December. In his application the AG wants the human rights lawyer and Justice Bhunu's clerk to be placed before the trial court for a continuation of the trial. Officers in Criminal Investigations Department are being investigated after reports they are demanding bribes from people applying for police clearances. The clearances are vital for people applying for civil service jobs, bank loans, foreign visas and work permits in neighbouring countries. One woman said she had been asked for $10 to have her papers processed the same day. An officer in the Serious Fraud Section said activities of CID at Morris Depot in Harare were being closely monitored following complaints. "No-one has yet been arrested but we are investigating," said the officer. He also claimed that some wanted criminals were being cleared after giving kickbacks to the corrupt detectives. A sale of the country's previously banned diamonds is set to go ahead on Wednesday. Aa deal reached between the Mines Ministry and the Kimberley Process last month will allow Zimbabwe to sell two batches of diamonds. The Zimbabwe Mining Development Corporation (ZMDC) has a multi million dollar stockpile for sale, were mined by their partner firms, Mbada Mining and Canadile Mining, who were licensed to mine the Chiadzwa site after it was seized in 2006 from the African Consolidated Resources (ACR). ACR has been fighting a legal battle ever since over ownership of the site, with the group's CEO warning that international buyers will be buying stolen goods if they buy the diamonds mined by Mbada and Canadile. The SADC tribunal was never suspended, contrary to Zanu-PF's announcements which were meant to deceive the world about the regional judicial body which has declared President Robert Mugabe's violent land reform programme illegal. State media rushed to announce Justice Minister Patrick Chinamasa's claim that the tribunal had been suspended for six months. The Southern African Development Community (SADC) executive secretary Tomaz Salamao however revealed Wednesday that the (SADC) Tribunal was not suspended. "No-one suspended the Tribunal. What was said is that the Tribunal's role or responsibility has to be reviewed by professionals and experts to come up with clear recommendations," he said. "In the meantime, they can deal with those (cases) they have at hand." This entry was posted by Sokwanele on Friday, September 17th, 2010 at 12:07 pm.